New ships and crew also added. Update: Edge Case CEO James Brooksby has responded to the community's displeasure at some of Fractured Space's recent updates with the following statement. "The new Crew Collection System has been rolled out in a way that we are not proud of, and you guys have reacted to in a very understandable way. We have always worked closely with you, the community and listened along our journey through Early Access. And we are listening now. Our sincere apologies—do stick with us—and I will see you on battlefield." Original story: Fractured Space is a 5v5 team shooter in which every player plays as a capital ship delivering broadsides in the depths of space. Today's update means it's now free to play in Early Access on Steam. The update adds new sector maps, ships, crew members and missions, as well as a firing range where players can test ships and loadouts. “Fractured Space is fundamentally team-based and we believe the new update will add a strong competitive element to our universe and increase accessibility to new players” says Edge Case CEO James Brooksby in the release accompanying the update. Recent updates don't seem to have gone down well with the community, however. Recent Steam reviews have turned against changes to the progression system, particularly the ones associated with the use of in-game currency to unlocking crew members. “We listen to our community and get their feedback, and this continues to help us shape the game as we move closer to full launch” Brooksby adds. 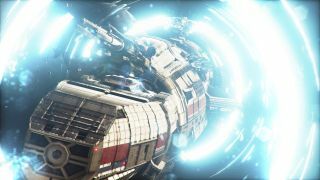 We'll have to wait and see if Fractured Space's free-to-play incarnation delivers good value in the coming weeks. You can find out more about the game on the official site.